Our systems can be portable or fully installed, linking back to a web-based computer for assessment and reporting. The following systems are available for transport and city noise monitoring. 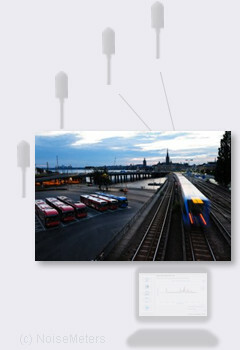 Noise monitors by the rail track can collect noise from all passing trains, logging the sound levels and related parameters to internal memory. These measurements can be transmitted back to a central computer via a GSM link, or it can be downloaded directly onto a portable computer. Rail noise monitoring can help for planning expansions or for assessing noise reduction work. Positive Identification - Trains can often be detected based on their acoustic profile. Where other noise sources are present (roads, etc.) or when you need to know the exact train that made the noise, a system offering positive identification is available. Please contact us for more information. Road and motorway noise is often monitored for shorter periods using the portable noise monitors, which store the noise levels continuously for the purpose of planning and noise mapping. For this type of mobile noise monitoring, please consider the portable Outdoor Noise Kits. For the longer term monitoring of roads, motorways and city centres, the EM2010 Noise Monitor with GSM / 3G link and online reporting is the ideal solution. When dust and vibration need to be monitored to, the Guardian Environmental Monitor is the best choice.